Attention, Wildwoodians! 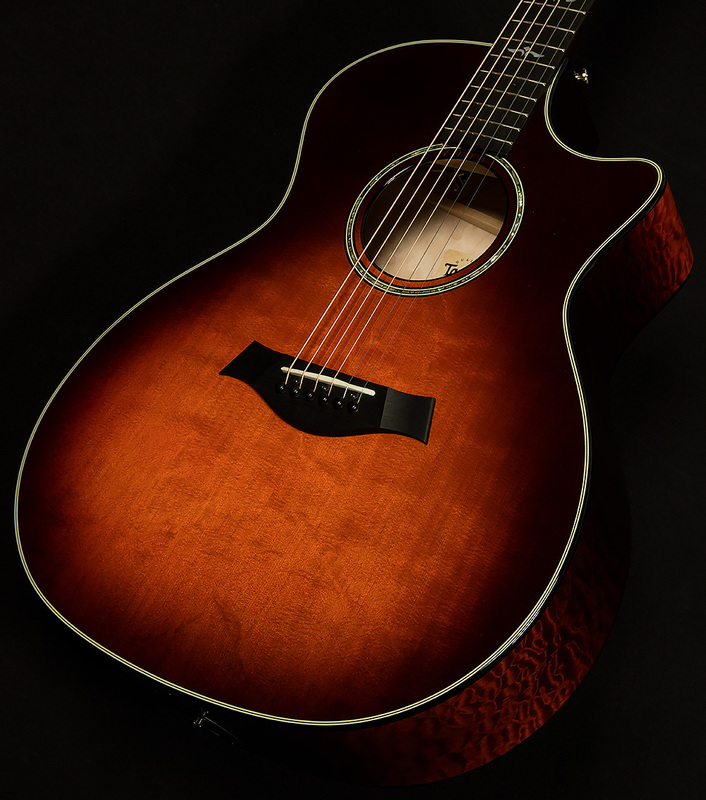 This 614ce is a limited edition model that a sweet desert sunburst finish atop its torrefied spruce top and quilted maple back and sides. Apart from being a rare and beautiful wood, quilted maple is known for its warmer timbre. 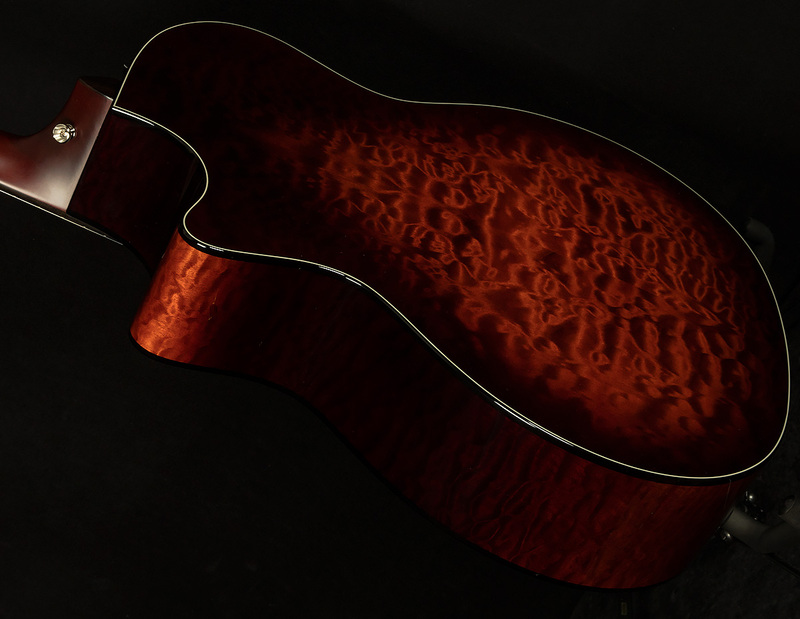 As a result, this guitar is one of the warmest, sunniest 614ce's we've ever had! We're sure you'll fall in love after one strum. Feel free to read on for more general information about why the 614ce is such a delightful instrument. Andy Powers is a visionary, a genius, and possibly a wizard. Whether he has magic powers or not, he has revolutionized the world of acoustic guitar design as Taylor's master guitar designer. 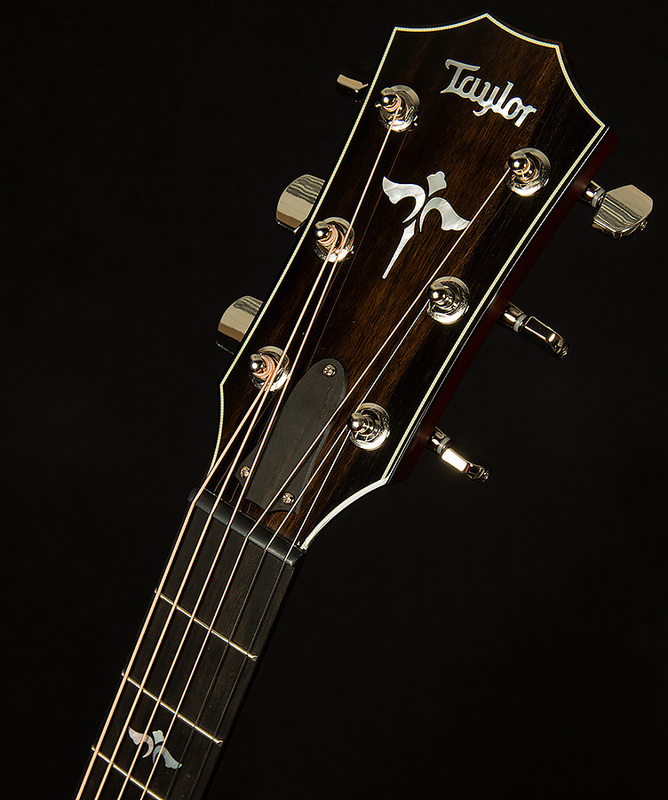 His first project was to redesign of Taylor's 600 Series guitars, and his enhancements put his brilliance on full display. Basically, Andy re-defined what a guitar with maple back and sides can be. The 600 series features guitars with spruce tops and maple back and sides. This classic combo has produced many legendary sounds, but some guitarists are a bit leery of dipping their toes into the wonderful world of maple. Though maple-bodied guitars are renowned for their bright, clear, transparent tone and exceptional articulation, they can sound a bit strident and thin until the aging process mellows them out. Andy Powers sought to rectify this problem and craft a maple-bodied acoustic that everyone could love. In order to accomplish this Heruclean feat, Andy utilized the magic of torrefaction. Basically, torrefaction is when you heat a piece of wood to somewhere between 200 and 320 °C. At that point, the wood dries out and develops a cellular structure similar to an actual vintage instrument that has aged naturally. More importantly, the torrefaction process imparts a vintage sound. Guitars with torrefied tops have a warmer, woodier timbre with a rounder attack and greater openness. All of these qualities are heavenly when paired with maple. You get crisp, quick response, fast decay, superb articulation, and a bright chiming high end from maple. Then, the torrefied top gives that sound a healthy sunny glow by smoothing out the harsh edges and providing balancing warmth. Normally, maple guitars are bright and transparent. The redesigned 600 series still sounds transparent, but now the guitars mostly sit right in the middle of the spectrum between bright and dark. By using torrefied tops and tweaking the bracing pattern, Andy Powers has redefined what is possible with maple. Speaking of redefining what is possible with an acoustic guitar, let's talk about the 614ce's V-Class Bracing. V-Class Bracing. 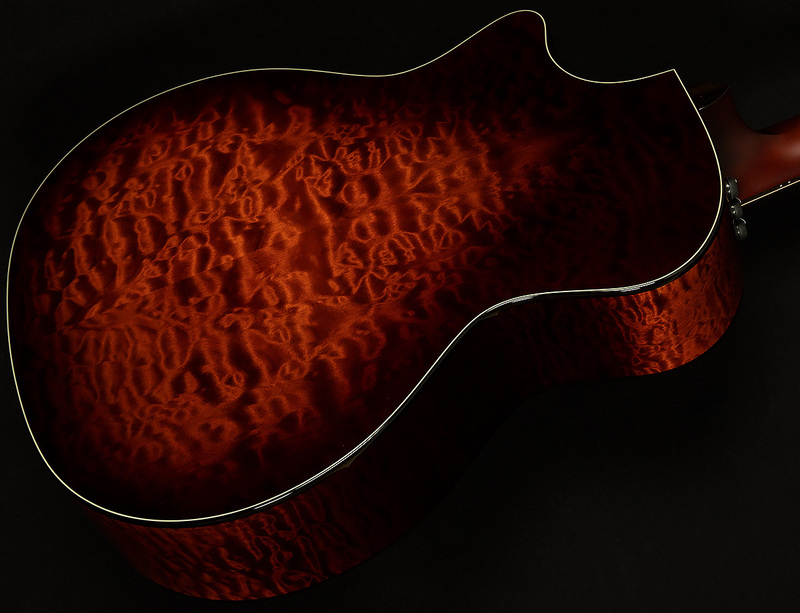 an elegant solution to a problem that has plagued luthiers for decades. 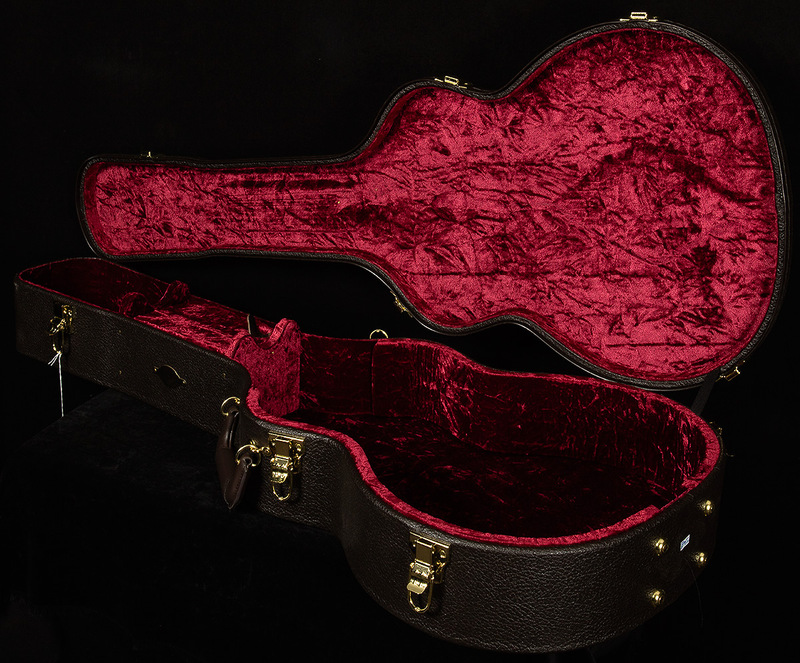 For years, acoustic guitar builders had to compromise between volume and sustain. Flexibility equals volume, and stiffness equals sustain. Obviously, a piece of wood cannot be rigid and flexible at the same time, so builders had to go for one or the other. So, you get volume from the flexible parts of the bracing, and sustain from the rigid parts! Many areas of the guitar neck that typically sound weak (ninth fret on the G string, for instance) have just as much presence, resonance, and sustain as the low E. As a result, the 614ce sounds supremely balanced and sculpted. When you hear one played live in the room, you'd swear a mix engineer had already done a bunch of post-production work on it. And, it gives the guitar piano-like note separation and crystalline clarity even when you play fancy jazz chords! By contrast, guitars with V-Class bracing vibrate in a much more orderly manner. The graduated braces compel the energy from the player's attack to move from the thin outer part of the bracing to the thicker inner part in a efficient manner. If you were to take a high-speed shot of a V-Class top, you would see it rock back and forth evenly in a pleasing pattern. Because of that V-Class magic, the 614ce sounds so in-tune that it's scary. We're proud to showcase such an inspiring instrument for our exceptional customers. Thanks to Andy Powers's redesign and subsequent development of V-Class bracing, the 614ce sounds like no maple guitar you've ever heard. We invite you to pick one up, give it a strum, and experience the magic of maple. Once you do, you'll be completely addicted to the 614ce's sweet sounds.